The mystery that is "Beacon Wood"
The building previously known as 'Beacon Wood' was purchased by the Council in 1966 and developed into the Office of the Registrar of Births, Deaths and Marriages. The exact summit of Crowborough Beacon is recorded at 793’ or 242m and lies adjacent to a private property, although not actually marked on the ground. 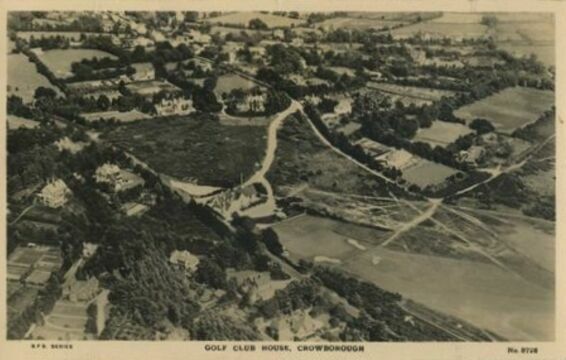 The summit, the second highest point in East Sussex after Ditchling Beacon is almost exactly 1km (1,130 yds) north of the Crowborough Beacon Golf Clubhouse, so about 1000 yds from what others misleadingly refer to as 'Beacon Wood'. Amongst the 'Common Myths and Misunderstandings' section of this website you will find this answer to a simple question; "So, just where is Beacon Wood"? Another website incorrectly refers to "Beacon Wood, the cherished summit of Crowborough’s ancient common (c.1564) that forms the town’s distinctive wooded gateway." The facts of the matter are that Beacon Wood does not exist either in name or actuality. And secondly that the area of Common question falls well short of the summit, as the ancient aerial photographs clearly show. As far back as the 1825 map viewable on the weald.org website you will find 13 named woods but no Beacon Wood - it does not exist. The maps of 1825, 1875 and 1899 will clearly show the other 13 named woods all within a short walk of the golf course, as Dother Wood; Sweethaws Wood; Moulden Wood; Oaky Wood; Piping Wood; Newnham Park Wood; Broadfield Wood; Fouracre Wood; Turkland Wood;Quarry Wood; Little Wood; Walsh Wood; Scaland Wood and Common Wood. If you 'google' Beacon Wood you will instead see that it is the home of the Council Offices some three quarters of a mile up the hill, where it is actually home to the Registrar of Births Deaths and Marriages. If there was ever a “Beacon Wood” which seems doubtful, in the complete absence of proof, perhaps it was actually developed into buildings now used by the local Council? Now that would be ironic. 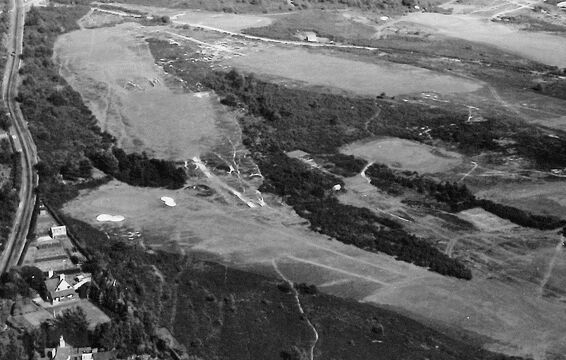 These aerial photographs from over 60 years ago show an area almost devoid of trees, instead an open heathland.